TG211: The Who and the story of mod! 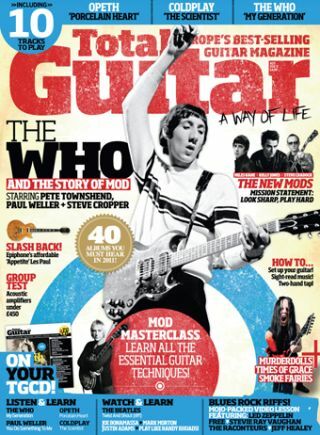 Total Guitar issue 211 will be available on newsstands from 21 January to 18 February and the latest issue is dedicated to all things mod guitar! For its decades of devotees, mod guitar is a way of life. TG goes back to the 60s to trace the movement that's still spawning stars today. From Steve Cropper's soul sounds through to Arctic Monkeys' post-millennial mod, TG shows you how to play like the movement's heroes. Steve Cropper - the soul man, Steve Cradock - the mod authority, Kelly Jones - the modern icon, and Miles Kane - the 21st century boy. The biggest and best guitar albums you must hear this year. Killswitch Engage guitarist Adam D talks to TG about his new band, and how he wrote the debut album from his hospital bed. Joey Jordison and Roman Surman tell TG how their passion for songwriting is alive and kicking. This month's gear section features reviews of the Epiphone Slash 'Appetite' Les Paul signature, Gus G's new Blackstar HT-Blackfire distortion pedal, Avid's Recording Studio package with Pro Tools SE and the M-Audio Fast Track interface, the Line 6 POD HD500 floor unit, Jackson's JS32 Kelly, Guitar Tech pedals and a Group Test of acoustic amps. The Who 'My Generation', Opeth 'Porcelain Heart', The Beatles 'Twist And Shout', Coldplay 'The Scientist', Paul Weller 'You Do Something To Me' and five classic blues rock riffs (including Steve Ray Vaughan, Free, Led Zeppelin and The Jeff Healey Band). Win a Peavey Vypyr half-stack worth £800! Amp modelling has come a long way over the last decade, but as flexible as it can be, some guitarists still crave the subtle glow and classic break-up of valves. The Vypyr Tube 120H head gives you both, and thanks to its makers, Peavey, we're giving you the chance to win a Vypyr half stack.